Oregon Landing Page – 3 Phases Renewables Inc.
* Rebate to be paid after 6 months of service. Offer made exclusively to commercial and industrial customers with facilities located in the State of Oregon that are currently customers of Pacific Power or Portland General Electric. Must sign at minimum a 12 month agreement for service with 3 Phases to claim offer. Offer valid on one service account per customer and subject to a maximum rebate of $10,000 per customer. Terms subject to change at any time without notice. Void where prohibited. Click here to learn more about how Hopworks Urban Brewery uses renewable power from 3 Phases Renewables. 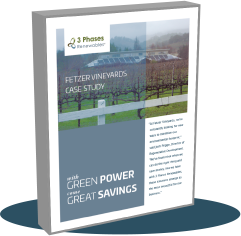 "At Fetzer Vineyards, we're constantly looking for new ways to minimize our environmental footprint," said Josh Prigge, Director of Regenerative Development. "We've found that when we can do the right thing and save money, like we have with 3 Phases Renewables, those solutions emerge as the most impactful for our business." © 2016 3 Phases Rewnewables Inc. All rights reserved.